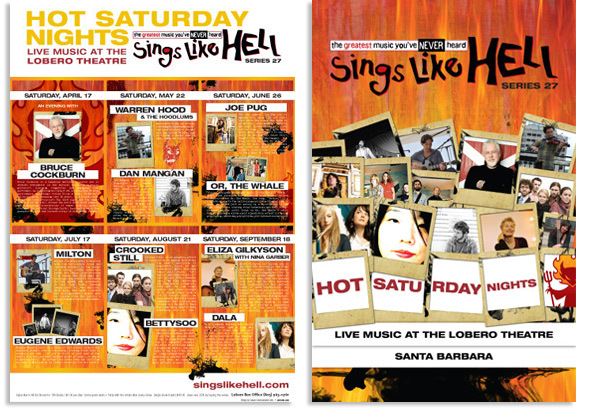 Sings Like Hell is a critically-acclaimed series of musical concerts created and produced by the wise and talented Peggie Jones, and presented at the historic Lobero Theatre in Santa Barbara, California. 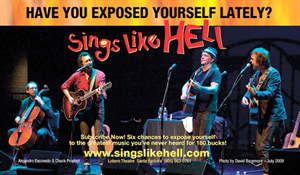 The music for Sings Like Hell ranges from pop and rock through folk and reggae, with rap, bluegrass and jazz thrown in. The musical focus is on singer songwriters. Sings Like Hell is now in presenting its twenty-seventh series of the greatest music you've never heard. Sings Like Hell created a space where genuinely talented singer-songwriters can perform their art in the presence of an appreciative, intelligent audience in a beautiful, historic theatre...in Santa Barbara. In reality, it's a monthly musical pot-luck party for 600 close friends! Sings Like Hell is an example of a community taking control of its own musical destiny. As Robert Hilburn of the Los Angeles Times wrote, "Sings Like Hell...feels like a valuable oasis in the middle of a pop scene too often dominated by spectacle." Cowan Communication Arts has been working with Sings Like Hell since series 19. Our work with Sings Like Hell includes the design of the series program, posters, direct mail pieces, print advertisements, advertising placement, and more. We are looking forward to attending the remaining shows in Series 27… culminating in a special evening with one of our favorite artists, Eliza Gilkyson. Hope to see you in hell!